120 Wholesale Cream Chargers - Free Shipping! Wholesale Cream Chargers. Free next day delivery. Standard size to fit all dispensers. As befits the needs of professional users, these are the highest grade of whipped cream charger and only contain 100% pure nitrous oxide. They are manufactured in a state-of-the-art plant to the highest specifications and every canister is checked to ensure it is completely filled (unlike some budget brands that can leave customers a little short). A nickel coating on each charger ensures that should they come into contact with moisture in storage they will no rust or perish – this also helps to ensure long-life and a quality product. Select the correct grade of cream. As its name would suggest, whipping cream is ideal for the job, however any cream with a fat content of 25% - 35% will work so you can choose a cream that will work best for you. For wholesale cream chargers you do not require wholesale cream - each charger can whip as little as 0.25L. If necessary then pre-sweeten or flavour the cream – do this before adding to the whipped cream dispenser to make sure it is fully dissolved. Some flavours will require heating and cooling to ensure the maximum flavour diffuses into the cream, others simply need time to blend and meld the flavours. Pour the amount of cream you need into the whipper. You will need to think how much final product you need and then divide by three to estimate the raw ingredients. A single charger is designed for a full 0.5L whipper, so if you are using a larger whipper then you may need to use to chargers to achieve the desired effect. Once the cream is inside the whipper then you can screw on the dispenser head. The silicone gaskets will ensure a good seal – remember that it has to be able to withstand high pressure as the charger releases its contents into the dispenser. Place a single 8gm charger cylinder into the charger holder and screw it down tightly. This perforates the top of the cylinder and lets the gas escape into the body of the whipper. We sell comfort grips that fit over the charger holder if you find gripping it difficult. Once primed and charged with nitrous oxide gas, the cream can remain inside the whipper until required. When need simply gently squeeze the handle of the whipper and allow the cream to be propelled out by the nitrous oxide gas. 1200 Wholesale Cream Chargers - this is our biggest box! With a box of wholesale cream charges for your cafe, you may want to take a few home with you - so perhaps this recipe will help you utilise your bulk chargers. Children or adults, we all love the ice creams. When this special ice cream has a lot of fruits and whipped cream on the top, we will hardly be able to stop preparing it over and over again. And it is so easy to do it, as in less than 30 minutes, your special treat will be ready to use. The speed with which cream chargers can created whipped cream mean that what might once have been considered a Sunday sundae treat is now an everyday occurrence. Prepare the whipped cream first, as it should be kept in the refrigerator for at least 30 minutes. The cream chargers (once primed) will hold he pressure for a long period of time insider the dispenser. Mix the milk, the eggs and the sugar. Stir it slowly until it gets a certain consistency. Keep it in the fridge for at least 1 hour before use. Thereafter, add the fruits and the lemon juice and pour the content into an ice cream maker. The entire mixture should be put in the fridge and let to rest for at least 2 hours. Add the whipped cream and your delicious ice cream is ready to use. For a new twist then mix some flavor into the cream before you charge it with nitrous oxide. Why not use a dash of syrup or even some raspberry sauce before attaching the cream chargers. This makes an even better ice-cream treat. 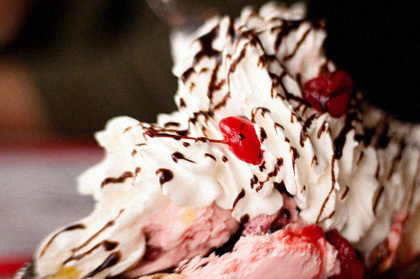 Ice cream and whipped cream make the perfect bed-fellows. If you buy some cream chargers from the Cheeky Monkey then you'll be able to recreate the partnership as often as you like with minimum fuss - all you need is the whipper, the chargers and the cream. The same quantity of brown sugar can be used as well. If you prefer honey, you need to add 3 tbs. Whole milk can be used. Wholesale cream chargers have no expiry date so they will last forever and can be used at your leisure. The custard can be prepared at least 12 hours before use. The ice cream content can be kept in the fridge for at least 3 days. Instead of raspberries you can use strawberries or even apples and rhubarb. You can change the fruit ingredients and thus you can change the type of ice cream not only for a day to another, but also from a season to another. To balance the tartness of the lemon in the recipe then a bit of caramel or even maple syrup combined in the dispenser prior to the cream chargers being attached makes a great combination. Fresh lemonade or a cup of fruit tea can accompany the exquisite tasting experience of this ice cream. Not for sale to children. Please read our full terms and conditions before you purchase this product. When you need wholesale cream chargers the there are only a few places that I trust. I'm in the trade so I need to know I'm going to get what I order in time - it is one thing to promise next day delivery, another thing to actually deliver it constantly. So, I've stopped looking for cheap chargers - instead when I'm shopping wholesale then I look for quality, fast wholesale supplies. It isn't about trying to save a couple of quid by buying off some no-name on ebay, it's about trusting a pro to see you right.